I've been busy, busy, busy, what with school, the Fling, and finishing up our outdoor kitchen so that it would be ready for a Fourth of July cookout. The result is that I haven't been posting my progress on the backyard as much as I should, but all that is about to change. First, however, I need to announce the winner of the Troy Bilt string trimmer giveaway. I put all the names in a hat and let Walu draw one out, and the winner was Zoe Ann Stinchcomb. If you don't know Zoe Ann, you should, as she is a lovely, lovely human being, and, among other things, winner of the 2008 Wildlife Forever Educator of the Year. All of you who entered were deserving of the trimmer, but you can be pleased that someone as fine as Zoe Ann won it. And now, for some before and after photos of the outdoor kitchen. The deck has been recycled in other ways, too, and I'll post some before and after pics of those in the future. I'll also post something about the Fling, which I am still busy processing. It was powerful and has given me a lot to think about. 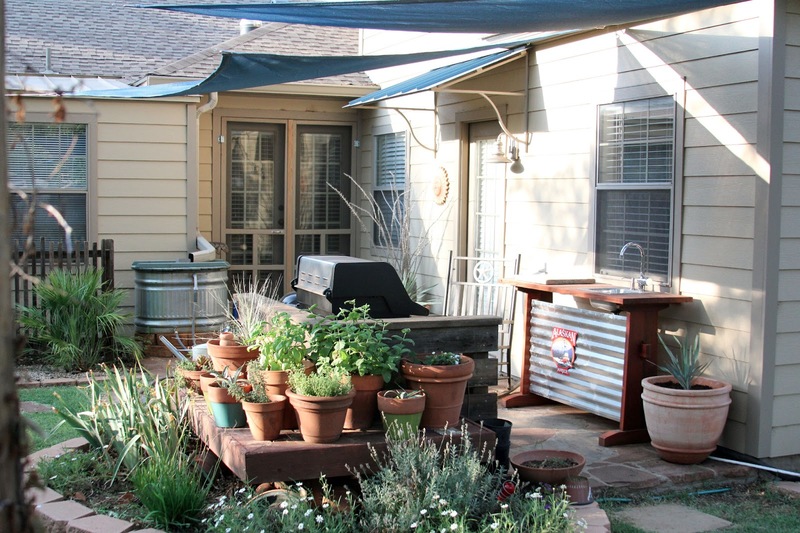 It was also inspirational, since it was seeing Rebecca Sweet's most excellent garden that motivated me to come home and finish the outdoor kitchen. I'll have photos of Rebecca's garden and more coming up in a few days. The kitchen looks great ... I love the sink stand! I love it Susan!! And those shades look great. I love the sink stand too, Susan, and I'll look forward to more detail on how you built it now that I have experience working with corrugated galvanized in a variety of applications. Is it just connected to a drinking-water hose? Never mind, you can answer that later in your more-detail post. It all looks great! How have the sails held up to the rain you have had the last few days? I think your outside kitchen is wonderful! That looks great, Susan -- perfect for fun evenings cooking and relaxing in the garden.